In this article, you will get quick revision notes on CBSE Class 12 Chemistry: Chapter 11 - Alcohols, Phenols and Ethers. This article is a continuation of the revision notes on CBSE Class 12 Chemistry, Chapter- Alcohols, Phenols and Ethers, Part-I. In this article, you will get quick revision notes on CBSE Class 12 Chemistry: Chapter 11 - Alcohols, Phenols and Ethers. This article is a continuation of the revision notes on CBSE Class 12 Chemistry, Chapter- Alcohols, Phenols and Ethers, Part-I. In Part-I you got acquainted with the alcohols, their classification, preparation, properties, etc. In Part-II, you will get to know about the phenols, their preparation, properties and uses. These CBSE revision notes are based on the latest CBSE syllabus for CBSE Class 12th Chemistry. Phenols are the compounds formed when a hydrogen atom in an aromatic ring, is replaced by a hydroxyl group (-OH group). They contain only one OH group. Such phenols contains two OH groups. This type of phenol contains three OH groups. • The simplest hydroxy derivative of benzene is a phenol. Phenol is the common name as well as an accepted IUPAC name of the compound. • In the case of substituted phenol compounds, the terms ortho (1,2- disubstituted), meta (1,3-disubstituted) and para (1,4-disubstituted) are often used as prefixes in the common names. In phenols, the –OH group is attached to sp2 hybridised carbon of an aromatic ring. The C–O bond length (136 pm) in phenol is slightly less than that in methanol. This is due to (i) partial double bond character caused by the conjugation of unshared electron pair of oxygen with the aromatic ring and (ii) sp2 hybridised state of carbon to which oxygen is attached. The C−O−H bond angle in alcohols is slightly less than the tetrahedral angle (109°-28′) due to the repulsion between two lone pairs of electrons present on oxygen. Phenol is prepared commercially by cumene-phenol process in which cumene (isopropylbenzene) is oxidised to cumene hydroperoxide which on treating with dilute acid yields phenol and acetones. • Phenols are colourless liquids or crystalline solids but become coloured due to slow oxidation with air. • Due to the presence of strong intermolecular hydrogen bonding, phenols have a higher boiling point than the corresponding hydrocarbon or aryl halides. • Due to their ability to form hydrogen bonds with water, phenols are moderately soluble in H2O. • The phenols are acidic in nature and stronger acids than alcohols. This is due to the fact that the sp2 hybridised carbon of phenol to which −OH is attached, is highly electronegative which causes a decrease in electron density on oxygen. This Increases the polarity of O−H bond and results in an increase in ionisatlon of phenols than that of alcohols. Moreover, the phenoxide ion so produced is stabilised by the delocalization of charge in phenol. The presence of OH group on benzene increases the electron density on the benzene ring making it more susceptible to attack by an electrophile. The reactions involving benzene ring are electropnilic substitution reaction. The presence of OH group makes the orthoand para carbon of benzene more electron rich than meta position. The OH group is called o ‒, p ‒ directing group. Esters of phenol gives phenolic ketones on rearrangement in the presence of anhydrous AlCl3. 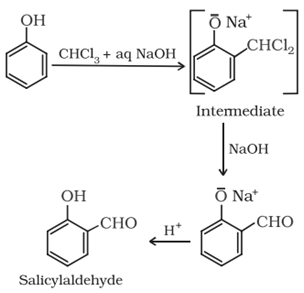 This reaction is called fries rearrangement. • It is used as an antiseptic. • It is used as a disinfectant in household cleaners. • It is used in the preparation of resins, dyes, explosives, lubricants, pesticides, plastics, drugs, etc.